The KL-Singapore high-speed rail (HSR) isn’t the only rail project that has been called off in a bid to save money – the government has also decided to pull the plug on the proposed Klang Valley Mass Rapid Transit (MRT) Line 3, according to The Star. The announcement was made by prime mnister Tun Dr Mahathir Mohamad earlier today following a Cabinet meeting. He said that the government is reviewing all projects that were previously initiated by the administration of former prime minister Datuk Seri Najib Tun Razak. 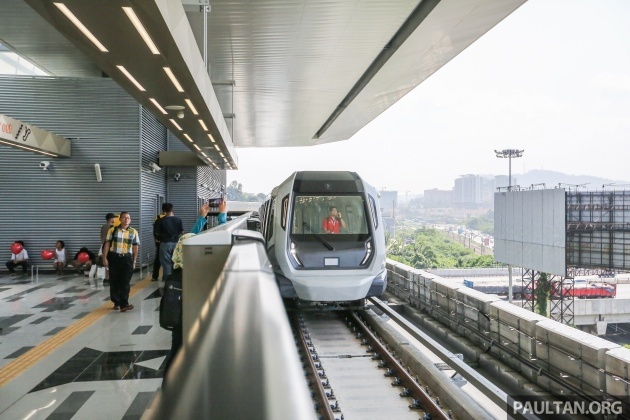 Also known as the MRT Circle Line, the fully automated and driverless rail system extension was to have formed the loop line of the Greater KL/Klang Valley integrated transit system. Originally targeted for completion by 2025, MRT3 was meant to provide coverage in areas surrounding Bandar Malaysia, Ampang, KL Ecocity, Bukit Kiara and Sentul. This will leave the Klang Valley with two MRT lines. The first, the Sungai Buloh-Kajang (SBK) line, was completed in two stages, with Phase 1 commencing operations in December 2016 and Phase 2 in July last year. Construction of the second Sungai Buloh-Putrajaya line has already begun, and it is expected to be completed by 2022. I support scrapping ECRL and HSG, but not MRT 3. No choice but got to do it. Cause hutang negara 1 trillion. Very critical. We have to pay for the previous sins of those who are corrupted. Pity us Malaysians. Now we won’t have MRT3 because there were maximum stealing and plundering taking place. If we weren’t heading to Venezuela then, we certainly are now, what with the reverting to SST and piling on more subsidies. Public transports have never been profitable anywhere, except when it cost an arm and a leg. So dun be daft. Without better public transports, the pipu will have less choices to commute and oso more cars means more pollution. People are just in love with whatever Tun M does its getting a bit too much. Cancelling the MRT is such short term thinking and we will pay for it. How? Well expect the roads to remain congested. Expect more time, petrol, productivity wasted being stuck in trafficm Expect Tun M or his successor to restart the project but with their own contractors and the project will cost more later on. I lived in Jakarta from 1999-2003. I’m imagining KL’s traffic will be on par with Jakarta’s, and also Manilla and Bangkok. Improve the bus system, learn from the Lion City. And impose toll to enter City. Make the city more walkable with trees and pathway. This measure is cheaper than MRT3, people would take the buses, and less traffic in the city. Win X3. If hutang negara is so much, why abolish GST? If new government is assume to be more reliable on handling gov fund, why afraid to continue paying GST? With no GST, are you sure 100% harga barang turun? or gaji naik? Of course got to cancel. Cause they may have found some strange thing. Just like our ECRL and HSR. All became double the PRICE. SO, they may have found out, MRT3 also became double the price. Now time to siasat and reduce the cost. Time to eradicate all the kickbacks. Should siasat also bnm forex scandal. Maybe can get back another 30 billions to settle out the debt. Should be restudy to reduce cost not cancelling it.. Meanwhile ECRL price revised upwards of RM11 Billion. Somebody in new regime gonna untung RM11 Billion atas angin. Welcome to “new” old MY! He’s just telling the truth. The trouble stirred is by those blinkered, ill-informed ilks such as you. This is just taking the easy way out. How can u distort the growth of the country just to save some money? We wanted the rot to be removed and the taxpayers money returned, not the good things removed that benefit the taxpayers! No wonder people are losing faith in this new government! What are they planning, everything just status quo? No progressive growth?? Planning to go Back to the Future! No pain no gain bro. That’s why PH have to Bite the Bullet so to speak. We bitten the bullet for GST which helps us to rode out the oil price crisis. What PH doing is not biting the bullet but biting the cyanide capsule. The some money U are talking is Not small $$$. That is billions we are talking here & we don’t have the billions NOW. To remove the rot, one must resort to STOP the rot from infection bro. Yeah. Just cancel it. Not a single one go to my work place anyway. Coz u work in the jungle man.. hahahaha.. Create a congestion zone that is known as greater KL. Maybe borders at bangsar, cheras until kepong. To enter this zone during peak hours, pay a congestion charge of rm20. Unless you are driving KL plate car, a V plate. So govt can start to reduce car prices unless one wants to have V plate, pay full tax and customs duties. Let’s talk about reducing half of excise duties of car price, and reduced loan period down to 6 years max. U decrease congestion by increasing prices, not reducing them. And removing the other alternative like MRTs just mean rakyat now stuck in hard place. That’d be a good idea. Adding more public transportations alone wouldn’t encourage people to utilise those facilities. Need some other way to limit traffic on city roads, thus encouraging people to use public transportations instead. Yes, please cancel, doesn’t make any difference meh if got up to MRT 10 also. Jalan still jem macam tu jugak. Malaysian mana suka naik public transport meh semua nak naik kereta. MRT3 shouldn’t be called off. MRT3 being a circle line is to compliment both MRT1 & 2. The government should review the funding and project management. Furthermore, our engineers, contractors and managers have gone through the learning curve to be expects. Don’t waste it. I believed Tun M team had done their study prior to make the decision of scrapping the MRT 3 project. They might find it not a cost effective or rather will be redundant with the current MRT & LRT line and future LRT & MRT 2. Furthermore the usage is burdened during weekdays and you hardly see good traffic on Saturday and Sunday. People prefer self driving or take GRAB to downtown KL on weekend. The new govt has not done any studies! In fact, they’re not even gonna fully abide by the recommendations of the CEP. Their priority now is to inflate debt figures to make it look like we’re in dire straits (Congrats, Malaysia, we are now the only country in the world that has a finance minister who doesn’t know what are the IMF guidelines for calculating national debt), and eliminate Najib-initiated projects, and then do something similar with their own cronies. We have plenty of reserves (over RM440 billion) and a tiny budget deficit (only 3% of GDP). We are far from going bankrupt. But you know la.. by spinning stories that the country is going bankrupt and that our debt is over RM300 billion higher than the IMF-recognized debt figures, this just makes it easier for them to make more money disappear without the rakyat questioning… they are robbing the country in broad daylight while the foolish rakyat say “Negara bankrap pasal Najib”..
Hehe. When the country DO go bankrap becoz of their thievery, then they will point the finger at Najib at shout “Heres the prove that Najib DID bankrap us”. Higher ed did not make them smarter, it just made them more gullible. Done study? U mean 2 weeks of “study” can counter the 1 year worth done by MRT Corp, including the station locations? Is this the same kinda study that says MY is going bankrap but now suddenly we r economically sound? this new government lack of idea. MRT already proven benefit to rakyat. 1 trillion debt is misleading, another excuse to ditch their manifesto. Share market jitters, Ringgit keep tumbling. Please get the right people to manage the crisis before everything turn upside down. good idea to scrap it off. The property market there will be stagnant and malaysians can consider buying at these places. Lastly increase the pay of bus drivers who are having good KPI and replace the bad ones instantly . MOT should works towards efficient feeder bus services just like Singapore and HK and not sleep on the job later. Public is watching MOT always. First of all, can MOT pay our bus drivers same living salary as SG & HK does, & gip them the proper training? I m sad of such things, cancelation on MRT3. Reduce reduce reduce hutang keliling pinggang…i support TunM decision. Next apply CBD charges to ease congestion in the city. Increase revenue, reduce expenditure especially those mega projects until we are financially strong again. MRT3 is good to on-hold until we can afford.